The IT industry covers Hardware & peripherals, networking, training, domestic and export requirements of IT services & products and IT enabled services. The IT industries contribution to the Indian GDP is 5.2% in the year 2007-08. India's IT industry growth is due to IT software and services like Custom Application Development and Maintenance (CADM), System Integration, IT Consulting, Application Management, Infrastructure Management Services, Software testing, Service-oriented architecture and Web services. According to the global infotech analyst International Data Corporation, the Indian IT and ITeS market is estimated to grow at the rate of 16 % to become a US$ 132 billion industry as well as the domestic market is expected to become over US$ 50 billion. Simultaneously, the IT and ITeS exports are estimated to US$ 78.62 billion in 2012. 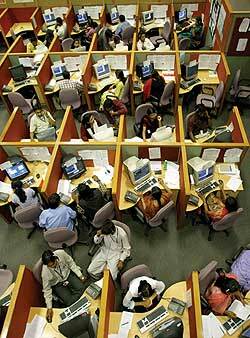 BPO Sector in India shown growth rate of 14 % in the first half of 2007. Also consumer electronics and IT hardware industries in India contribute a lot in increasing revenue. The Indian IT and ITeS industry had recorded a growth rate of 22.4 % in 2007 to become a US$ 60.57 billion industry as compared to US$ 49.47 billion in 2006. The IT industry is expected to employ 6 million people by 2009. The Indian advantage is the quality, price, and government support, quality of the labour pool, English language skills, project management skills, legal framework and the time difference. India has an arbitrage advantage of approximately 30-40% as compared to the US and the Europe.